Simpson's efforts have been described as "bold" and "innovative" by Unicef's UK executive director. London, England -- He's no Wyclef Jean or George Clooney, but that hasn't stopped seven-year-old Charlie Simpson from raising more than £150,000 ($240,000) for the Haiti earthquake. 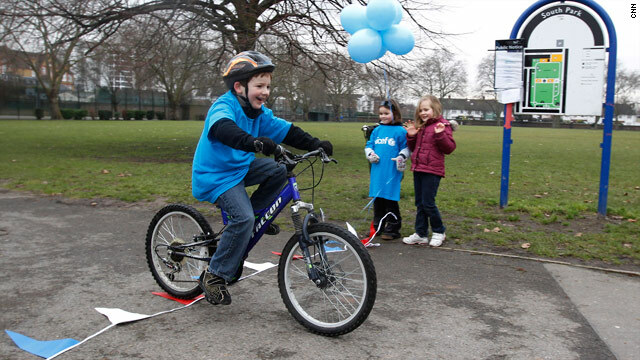 Simpson from Fulham, west London had hoped to raise just £500 for UNICEF's earthquake appeal by cycling eight kilometers (five miles)around a local park. "My name is Charlie Simpson. I want to do a sponsored bike ride for Haiti because there was a big earthquake and loads of people have lost their lives," said Simpson on his JustGiving page, a fundraising site which launched his efforts. "I want to make some money to buy food, water and tents for everyone in Haiti," he said. And with that simple call, messages of support flooded the site. "Such a big heart for a young boy, you're a little star!" wrote one supporter. "Well done Charlie. A real celebrity," said another. More donations began pouring in after the story caught the attention of the British media -- with many cheering Simpson past the £100,000 mark. Even British Prime Minister Gordon Brown is spreading the message. His "Downing Street" Twitter alias said: "Amazed by response to the great fundraising efforts of 7 yr old Charlie Simpson for the people of Haiti." David Bull, UNICEF's UK executive director described Simpson's efforts as "very bold and innovative." "It shows he connects with and not only understands what children his own age must be going through in Haiti," Bull said in a press statement. "The little seed -- his idea -- that he has planted has grown rapidly and his is a place well deserved in the humanitarian world. "On behalf of the many children in Haiti, I thank Charlie for his effort." Money raised by Simpson will go towards UNICEF's Haiti Earthquake Children's Appeal which will provide water, sanitation, education, nutrition as well as support child protection.